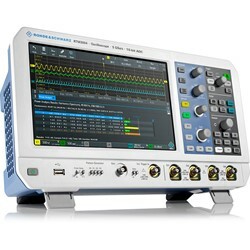 RTM3000 Rohde & Schwarz Oscilloscopes ! !Special Offers!! Premium 2 channel oscilloscope with 100 MHz - 1 GHz Bandwidth, 5 GSa/s sample rate, 10 Bit A/D converter, 80 Mpts memory depth and a 25.7 cm touchdisplay with a resolution of 1280x800 pixel. Upgradable to a MSO with a 16 channel logic analyzer, 1 channel waveform generator and pattern generator. 2x RT-ZP10 probe and power cord. Premium 4 channel oscilloscope with 100 MHz - 1 GHz Bandwidth, 5 GSa/s sample rate, 10 Bit A/D converter, 80 Mpts memory depth and a 25.7 cm touchdisplay (1280x800 pixel). Upgradable to a MSO with a 16 channel logic analyzer, 1 channel waveform generator and pattern generator. Premium 2 channel oscilloscope with 100 MHz Bandwidth, 5 GSa/s sample rate, 10 Bit A/D converter, 80 Mpts memory depth and a 25.7 cm touchdisplay (1280x800 pixel). Incl. MSO option with 16 channel logic analyzer. Upgradable with a 1 channel waveform generator and pattern generator. RTM3002 oscilloscope, RTM-B1 MSO upgrade option, 2x RT-ZP10 probe, logic analyser cable with 16 logic probes and power cord. Premium 4 channel oscilloscope with 100 MHz Bandwidth, 5 GSa/s sample rate, 10 Bit A/D converter, 80 Mpts memory depth and a 25.7 cm touchdisplay (1280x800 pixel). Incl. MSO option with 16 channel logic analyzer. Upgradable with a 1 channel waveform generator and pattern generator. RTM3004 oscilloscope, RTM-B1 MSO upgrade option, 4x RT-ZP10 probe, logic analyser cable with 16 logic probes and power cord. Premium 2 channel oscilloscope with 200 MHz Bandwidth, 5 GSa/s sample rate, 10 Bit A/D converter, 80 Mpts memory depth and a 25.7 cm touchdisplay (1280x800 pixel). Upgradable to a MSO with a 16 channel logic analyzer, 1 channel waveform generator and pattern generator. RTM3002 oscilloscope, RTM-B222 bandwidth upgrade, 2x RT-ZP10 probe and power cord. RTM3002 oscilloscope, RTM-B1 MSO upgrade option, RTM-B222 bandwidth upgrade, 2x RT-ZP10, logic analyser cable with 16 logic probes and power cord. Premium 4 channel oscilloscope with 200 MHz Bandwidth, 5 GSa/s sample rate, 10 Bit A/D converter, 80 Mpts memory depth and a 25.7 cm touchdisplay (1280x800 pixel). Upgradable to a MSO with a 16 channel logic analyzer, 1 channel waveform generator and pattern generator. RTM3004 oscilloscope, RTM-B242 bandwidth upgrade, 4x RT-ZP10 probe and power cord. Premium 4 channel oscilloscope with 200 MHz Bandwidth, 5 GSa/s sample rate, 10 Bit A/D converter, 80 Mpts memory depth and a 25.7 cm touchdisplay (1280x800 pixel). Incl. MSO option with 16 channel logic analyzer. Upgradable with a 1 channel waveform generator and pattern generator. RTM3004 oscilloscope, RTM-B1 MSO upgrade option, RTM-B242 bandwidth upgrade, 4x RT-ZP10 probe, logic analyser cable with 16 logic probes and power cord. Premium 2 channel oscilloscope with 350 MHz Bandwidth, 5 GSa/s sample rate, 10 Bit A/D converter, 80 Mpts memory depth and a 25.7 cm touchdisplay (1280x800 pixel). Upgradable to a MSO with a 16 channel logic analyzer, 1 channel waveform generator and pattern generator. Premium 2 channel oscilloscope with 350 MHz Bandwidth, 5 GSa/s sample rate, 10 Bit A/D converter, 80 Mpts memory depth and a 25.7 cm touchdisplay (1280x800 pixel). Incl. MSO option with 16 channel logic analyzer. Upgradable with a 1 channel waveform generator and pattern generator. RTM3002 oscilloscope, RTM-B1 MSO upgrade option, RTM-B222 bandwidth upgrade, 2x RT-ZP10 probe, logic analyser cable with 16 logic probes and power cord. Premium 4 channel oscilloscope with 350 MHz Bandwidth, 5 GSa/s sample rate, 10 Bit A/D converter, 80 Mpts memory depth and a 25.7 cm touchdisplay (1280x800 pixel). Upgradable to a MSO with a 16 channel logic analyzer, 1 channel waveform generator and pattern generator. RTM3004 oscilloscope, RTM-B243 bandwidth upgrade, 4x RT-ZP10 probe and power cord. Premium 4 channel oscilloscope with 350 MHz Bandwidth, 5 GSa/s sample rate, 10 Bit A/D converter, 80 Mpts memory depth and a 25.7 cm touchdisplay (1280x800 pixel). Incl. MSO option with 16 channel logic analyzer. Upgradable with a 1 channel waveform generator and pattern generator. RTM3004 oscilloscope, RTM-B1 MSO upgrade option, RTM-B243 bandwidth upgrade, 4x RT-ZP10 probe, logic analyser cable with 16 logic probes and power cord. Premium 2 channel oscilloscope with 500 MHz Bandwidth, 5 GSa/s sample rate, 10 Bit A/D converter, 80 Mpts memory depth and a 25.7 cm touchdisplay (1280x800 pixel). Upgradable to a MSO with a 16 channel logic analyzer, 1 channel waveform generator and pattern generator. RTM3002 oscilloscope, RTM-B225 bandwidth upgrade, 2x RT-ZP10 probe and power cord. Premium 2 channel oscilloscope with 500 MHz Bandwidth, 5 GSa/s sample rate, 10 Bit A/D converter, 80 Mpts memory depth and a 25.7 cm touchdisplay (1280x800 pixel). Incl. MSO option with 16 channel logic analyzer. Upgradable with a 1 channel waveform generator and pattern generator. RTM3002 oscilloscope, RTM-B1 MSO upgrade option, RTM-B225 bandwidth upgrade, 2x RT-ZP10 probe, logic analyser cable with 16 logic probes and power cord. Premium 4 channel oscilloscope with 500 MHz Bandwidth, 5 GSa/s sample rate, 10 Bit A/D converter, 80 Mpts memory depth and a 25.7 cm touchdisplay (1280x800 pixel). Upgradable to a MSO with a 16 channel logic analyzer, 1 channel waveform generator and pattern generator. RTM3004 oscilloscope, RTM-B245 bandwidth upgrade, 4x RT-ZP10 probe and power cord. Premium 4 channel oscilloscope with 500 MHz Bandwidth, 5 GSa/s sample rate, 10 Bit A/D converter, 80 Mpts memory depth and a 25.7 cm touchdisplay (1280x800 pixel). Incl. MSO option with 16 channel logic analyzer. Upgradable with a 1 channel waveform generator and pattern generator. RTM3004 oscilloscope, RTM-B1 MSO upgrade option, RTM-B245 bandwidth upgrade, 4x RT-ZP10 probe, logic analyser cable with 16 logic probes and power cord. Premium 2 channel oscilloscope with 1 GHz Bandwidth, 5 GSa/s sample rate, 10 Bit A/D converter, 80 Mpts memory depth and a 25.7 cm touchdisplay (1280x800 pixel). Upgradable to a MSO with a 16 channel logic analyzer, 1 channel waveform generator and pattern generator. RTM3002 oscilloscope, RTM-B2210 bandwidth upgrade, 2x RT-ZP10 probe and power cord. Premium 2 channel oscilloscope with 1 GHz Bandwidth, 5 GSa/s sample rate, 10 Bit A/D converter, 80 Mpts memory depth and a 25.7 cm touchdisplay (1280x800 pixel). Incl. MSO option with 16 channel logic analyzer. Upgradable with a 1 channel waveform generator and pattern generator. RTM3002 oscilloscope, RTM-B1 MSO upgrade option, RTM-B2210 bandwidth upgrade, 2x RT-ZP10 probe, logic analyser cable with 16 logic probes and power cord. Premium 4 channel oscilloscope with 1 GHz Bandwidth, 5 GSa/s sample rate, 10 Bit A/D converter, 80 Mpts memory depth and a 25.7 cm touchdisplay (1280x800 pixel). Upgradable to a MSO with a 16 channel logic analyzer, 1 channel waveform generator and pattern generator. RTM3004 oscilloscope, RTM-B2410 bandwidth upgrade, 4x RT-ZP10 probe and power cord. Premium 4 channel oscilloscope with 1 GHz Bandwidth, 5 GSa/s sample rate, 10 Bit A/D converter, 80 Mpts memory depth and a 25.7 cm touchdisplay (1280x800 pixel). Incl. MSO option with 16 channel logic analyzer. Upgradable with a 1 channel waveform generator and pattern generator. RTM3004 oscilloscope, RTM-B1 MSO upgrade option, RTM-B2410 bandwidth upgrade, 4x RT-ZP10 probe, logic analyser cable with 16 logic probes and power cord. Premium 2 channel oscilloscope with 1 GHz Bandwidth, 5 GSa/s sample rate, 10 Bit A/D converter, 80 Mpts memory depth and a 25.7 cm touchdisplay (1280x800 pixel). Inclusive a MSO with a 16 channel logic analyzer, 1 channel waveform generator and pattern generator and all software options. RTM3002 oscilloscope, RTM-PK1 option bundle, RTM-B1 MSO upgrade option, RTM-B2210 bandwidth upgrade (1 GHz), 2x RT-ZP10 probe, logic analyser cable with 16 logic probes and power cord. Premium 4 channel oscilloscope with 1 GHz Bandwidth, 5 GSa/s sample rate, 10 Bit A/D converter, 80 Mpts memory depth and a 25.7 cm touchdisplay (1280x800 pixel). Inclusive a MSO with a 16 channel logic analyzer, 1 channel waveform generator and pattern generator and all software options. RTM3004 oscilloscope, RTM-PK1 option bundle, RTM-B1 MSO upgrade option, RTM-B2410 bandwidth upgrade (1 GHz), 4x RT-ZP10 probe, logic analyser cable with 16 logic probes and power cord. Premium 2 channel oscilloscope with 100 MHz - 1 GHz Bandwidth, 5 GSa/s sample rate, 10 Bit A/D converter, 80 Mpts memory depth and a 25.7 cm touchdisplay with a resolution of 1280x800 pixel. Upgradable to a MSO with a 16 channel logic analyzer, 1 channel waveform generator and pattern generator. Incl. R&S® RT-ZHD60 100 MHz differential probe 100:1 / 1000:1. RT-ZHD60 differential probe, 2x RT-ZP10 probe and power cord. Premium 4 channel oscilloscope with 100 MHz - 1 GHz Bandwidth, 5 GSa/s sample rate, 10 Bit A/D converter, 80 Mpts memory depth and a 25.7 cm touchdisplay with a resolution of 1280x800 pixel. Upgradable to a MSO with a 16 channel logic analyzer, 1 channel waveform generator and pattern generator. Incl. R&S® RT-ZHD60 100 MHz differential probe 100:1 / 1000:1. RT-ZHD60 differential probe, 4x RT-ZP10 probe and power cord. Premium 4 channel oscilloscope with 100 MHz Bandwidth, 5 GSa/s sample rate, 10 Bit A/D converter, 80 Mpts memory depth and a 25.7 cm touchdisplay (1280x800 pixel). Incl. MSO option with 16 channel logic analyzer, I2C/SPI and UART/RS-232 decoding and History & segmented Memory option. Upgradable with a 1 channel waveform generator and pattern generator. RTM3004 oscilloscope, RTM-B1 MSO upgrade option, RTM-K1 decode, RTM-K2 UART/RS-232 decode, K15 History & segment memory, 4x RT-ZP10 probe, logic analyser cable with 16 logic probes and power cord. 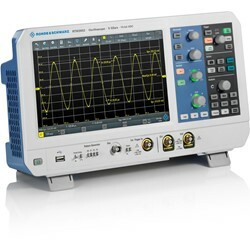 Premium 4 channel oscilloscope with 100 MHz - 1 GHz Bandwidth, 5 GSa/s sample rate, 10 Bit A/D converter, 80 Mpts memory depth and a 25.7 cm touchdisplay (1280x800 pixel). Incl. RTM-K31 Power Analyse option, RT-ZHD07 probe und RT-ZC15B probe. Upgradable to a MSO with a 16 channel logic analyzer, 1 channel waveform generator and pattern generator. RTM-K31 power analyse option, RT-ZHD07 probe, RT-ZC15B probe, 4x RT-ZP10 probe and power cord.